All bouts have to start with two fighters standing at a distance, and when they do there’s always a chance that someone is going to get dropped. Once a fighter scores a knockdown in a fight, their chances of winning rise dramatically, and often it sets up an early finish. That means that identifying knockout potential on a card can mean big points for your fantasy team. So where does that potential lie among the UFC 199 competitors? Here is how this weekend’s fighters stack up in their historical performance of scoring and receiving knockdowns in the cage. Knockdown Rate is defined as Knockdowns per Landed Power Head Strike. It’s not a perfect metric, but it’s a great proxy to understand how highlight reel finishes happen. 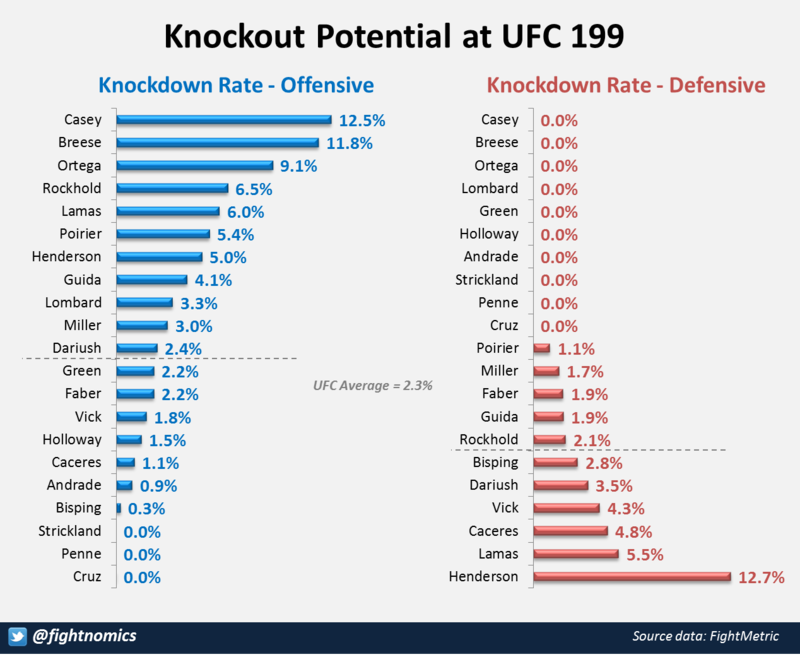 The UFC average for Knockdown Rate is 2.3%, meaning there are typically 43 power head strikes landed before a knockdown occurs, each with a 2.3% chance of being the strike that does it. But there’s a lot of variation between weight classes and the individual athletes within them. For fantasy players, this boils down to knowing who has a good chance to drop their opponent on fight night, and who is at risk for getting knocked out. In both cases, it’s better to be at the top of the graph, and worse to be near the bottom. Kevin Casey tops the list, albeit with a small sample size along with other newcomers such as Breese and Ortega. But more reliable heavy hitters including defending Middleweight Champion Luke Rockhold. And there are some strong hitters in the lighter weight classes on the list, such as Ricardo Lamas, and Dustin Poirier. Also, Hector Lombard and Dan Henderson who will be facing each other, both score above average in their power. Several fighters have yet to score a knockdown in the UFC, so don’t expect them to suddenly sling heavy leather. That includes current Bantamweight Champion Dominick Cruz, whose fighting style is much more about pace and movement than raw power. The same could also be said for Michael Bisping, who only scored his first career distance knockdown recently against Anderson Silva. Dan Henderson has been dropped more times than any fighter in UFC history, which is arguably the worst record to hold in the sport of MMA. On average, it now takes less than eight landed power head strikes to drop him to the mat, and he’s been finished by strikes in the first round in two of his last three fights. Fortunately for Henderson, Lombard is a somewhat hesitant striker, but he’s not lacking in power. And that’s not good for the 45-year old legend.